Maps and geography surround us in our daily lives, but did you know that the growth of cities had anything in common with the growth of trees, or the cells in your body? 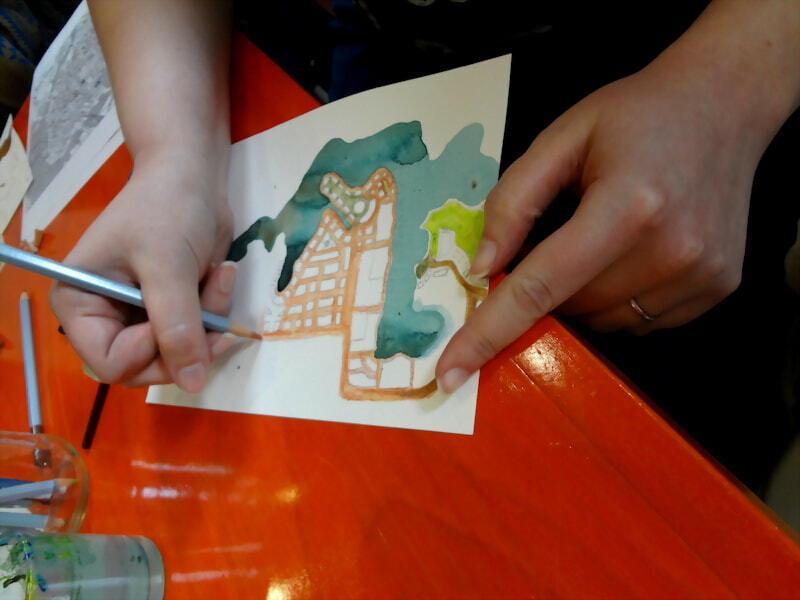 In this workshop, we’ll use maps and geography as a starting point to explore the variety of fractal, biological imagery in our world through drawing. Emily Garfield is a professional artist who uses geographic imagery in her work but is just as inspired by the maplike imagery that exists in nature. She’ll present some of how she develops her new drawing projects, and we’ll use these techniques to explore how maps as a graphic format relate to other natural patterns like cells and trees. Participants took the materials in different ways! 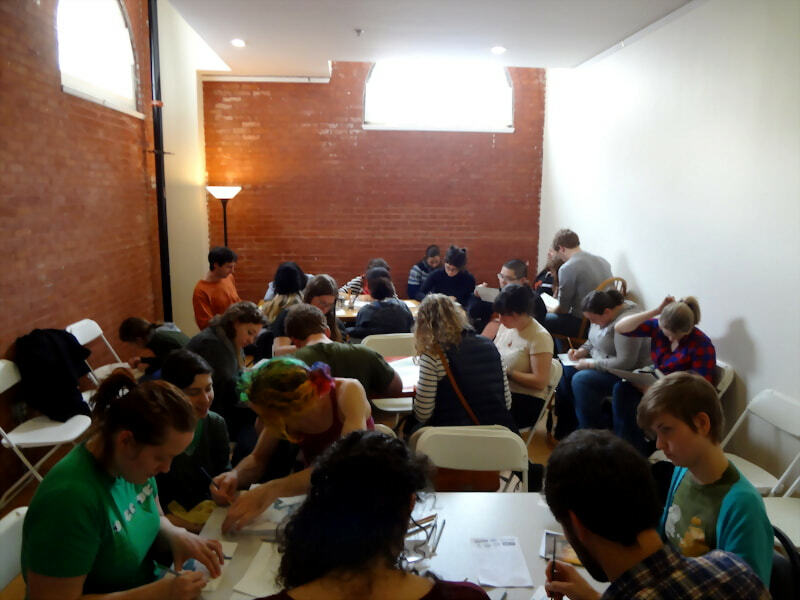 It was a more drop-in event so some people came for a moment to draw something they liked, and others stayed for the whole 2-3 hours and really dug into the material and the maps they found in their minds. 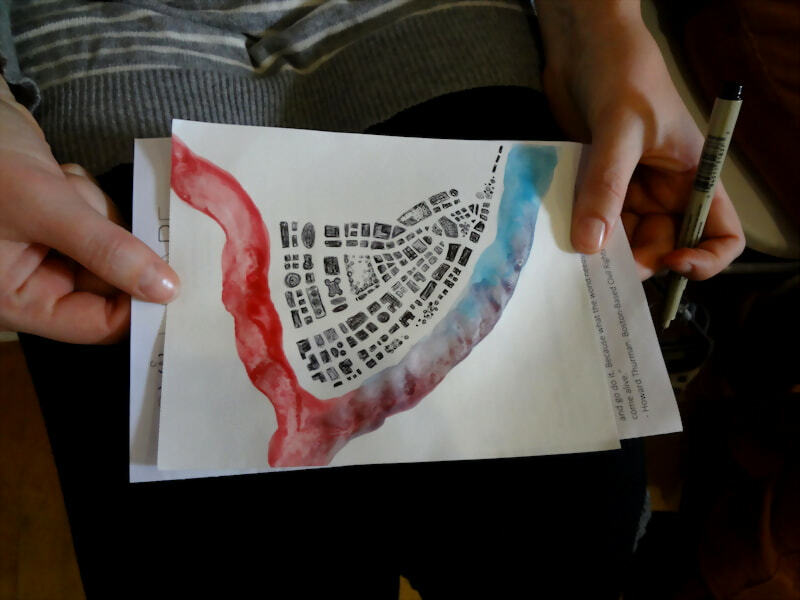 Last month I taught an imaginary mapmaking workshop as part of Hubbub, a children’s book festival produced by Boston Book Festival. There was a real range of ages, small children and older children as well as the adults with them, and I tried to come up with something that might have some interest for everyone—and be executable within an hour. I first asked participants to draw some thumbnails. I like teaching thumbnailing (which I remember learning for both high school art and college-level animation classes!) because it helps people get their ideas on paper without resorting to being precious or finicky about it. 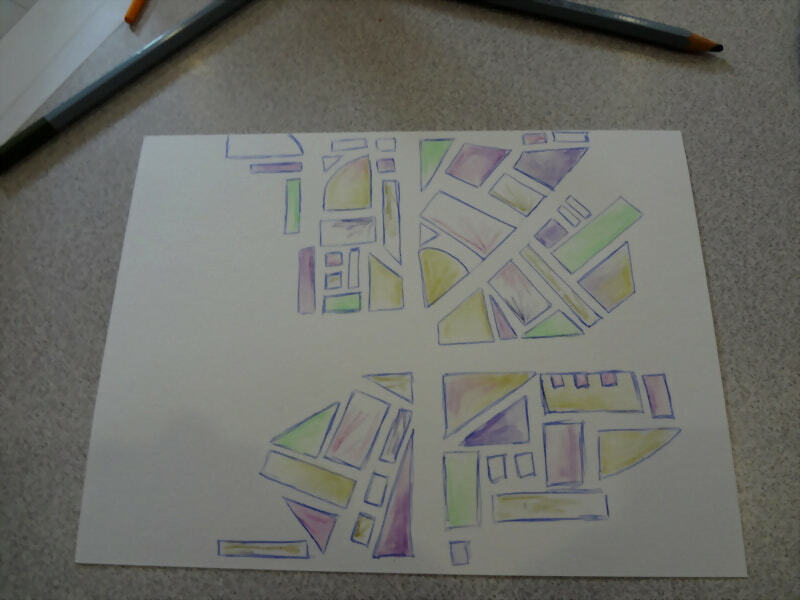 Then we chose from those thumbnails to work on a larger drawing. This is the way that I do pretty much everything—I sketch out visual ideas or conceptual algorithms for a piece starting at the smallest scale and continue to develop it as I scale up. The initial concept is usually pretty fully-formed already, so the critical part is to get it down as soon as possible. I’m always really impressed with what people draw. Even if they themselves aren’t proud, it’s always fascinating to me to see where people take my instruction and what they bring to it. Everyone has such different ways to map! I will be teaching another workshop for kids this Saturday November 8 at Parts and Crafts (577 Somerville Ave) from 1-3pm. I’ll have some of my sketches and inspirations handy, as well as lots of materials to get creative with mapmaking! 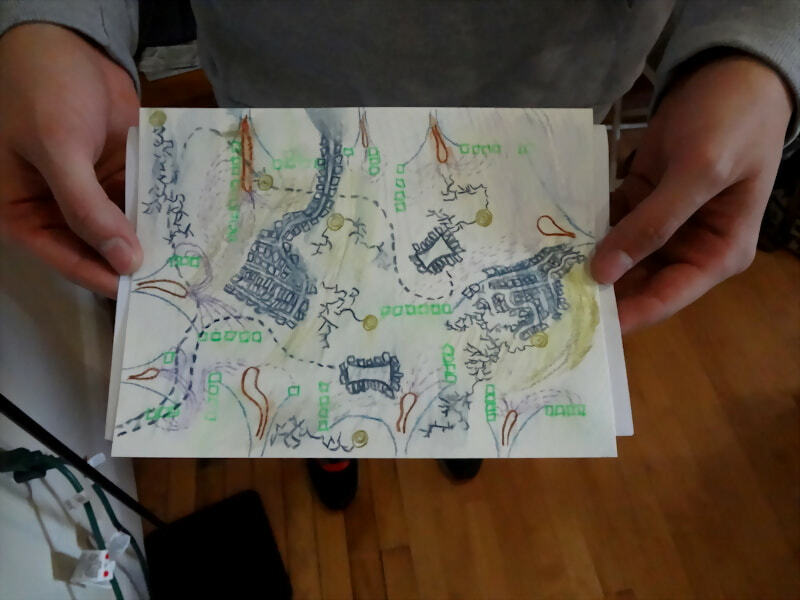 A map-making workshop like you’ve never seen it before, pairing fractals, biology, the patterns of cells and neurons with worlds of our own devising. 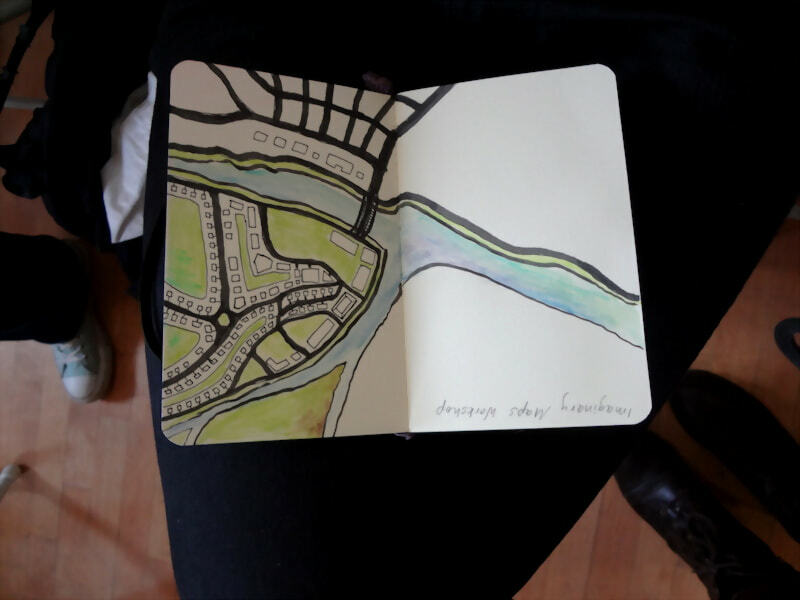 Hosted by Emily Garfield, a local artist specializing in cartography and flights of fancy. Come for open shop, stay for the workshop! The class is $25, or $15 for Parts & Crafts members; register here to attend. Parts and Crafts events are geared towards kids 7-12 years old. 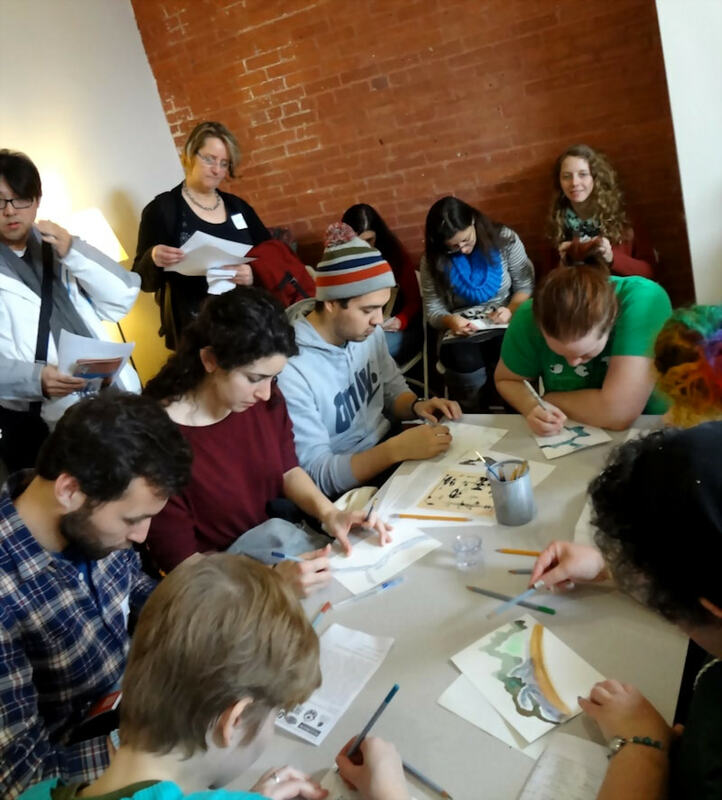 Last weekend I taught a short workshop on imaginary mapmaking at Somerville Skillshare, a day of free workshops held at the Armory. I was blown away by the response—people were lining up for it when I got there, and even though we admitted over twice the number of people I had originally planned for we still had to turn people away because we were out of seats!